The conference was opened by Dušan Stojičević, Chair of the RNIDS Board of Governors, who said that RNIDS had strategically supported the RSNOG community from the very beginning, as a forum for networking and discussion among Serbia’s network administrators, taking the lead from similar groups that exist in developed countries. Andrzej Wolski from RIPE NCC, the organisation that allocates numerical Internet resources for the region of Euroasia and the Middle East, then gave a word of introduction. Andrzej said that RIPE NCC, as a regional umbrella for the Internet technical community, would take every opportunity to support initiatives that aimed to strengthen ties amongst Internet professionals and promote the exchange of know-how and better communication. Closing the introductory portion of the event was Zoran Perović, member of the programme team of the RSNOG Conference and director of the Serbian Open eXchange, who expressed great satisfaction at the turn-out and outlined the major points of the event programme. The programme team had made it their priority to invite competent speakers, he stressed, who would address current topics in the area of Internet communications. Development in this field was so dynamic that no subject could be discounted as too new or advanced for the local audience. After the introductory talks, seven presentations were held on the following topics: IPv6 addressing (Vladimir Simić, JUNIS), DNS and CDNs (Nenad Krajnović, Belgrade School of Electrical Engineering – ETF), consideration of the need for a local federated cloud (Boško Radivojević, Mainstream), routing policies (Zoran Perović, Serbian Open eXchange), a system for the safe exchange of routing data (Andrzej Wolski, RIPE NCC), Carrier-Grade NAT (Milan Anđelković, Radijus Vektor) and a hybrid solution for protecting against DDoS attacks (Peđa Radoičić, Telenor). The second part of the meeting was devoted to discussion on the topic “Open Networking in Practice”, which started off with a presentation by Goran Slavić (Serbian Open eXchange) on real-life experience with the implementation of bare-metal switches. After that, a very interesting discussion was joined by Mina Tomić (Vip Mobile), Pavle Vuletić (AMRES) and Goran Slavić, with moderation by Nenad Krajnović (Belgrade ETF). All presentations, recordings of talks and photographs from the First RSNOG Conference are available on the web site of the RSNOG community (in Serbian only). The First RSNOG Conference also generated significant interest in the RSNOG community email discussion list. Half of all registered participants of the conference (66 people) expressed an interest in joining the discussion list, as did another twenty-or-so people after the Conference. The RSNOG email discussion list now has a subscriber base of more than 140 network administrators and other members of the Internet technical community in Serbia, which is a good starting point for us to organise a bigger and better conference next year. RSNOG (The Republic of Serbia Network Operators’ Group, rsnog.rs and рсног.срб) is an informal community of local network experts, gathered around a shared interest in improving the quality, performance, stability and security of Internet networks and services in Serbia. 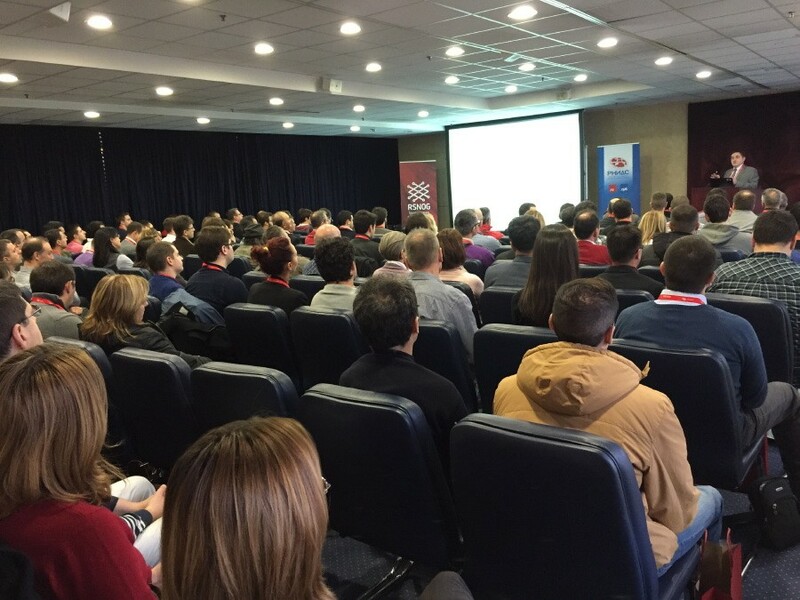 RSNOG actively encourages the exchange of ideas, knowledge and best practices among network experts in Serbia, as well as collaboration with similar groups in the region, Europe and all over the world. The Serbian National Internet Domain Registry Foundation (RNIDS, rnids.rs and рнидс.срб) is a professional, non-party, non-governmental, not-for-profit organisation, founded by the local Internet community in Serbia in order to manage the Serbian national Internet domains. RNIDS provides administrative, organisational and financial support to the RSNOG community and its activities. RIPE NCC (Réseaux IP Européens Network Coordination Centre, ripe.net) coordinates the forum of European IP networks, one of five global regional Internet registries (RIRs), responsible for the territory of Europe, the Middle East and Central Asia. The members of the organisation are local Internet registries to whom RIPE allots the IP addresses and AS numbers which are essential for the functioning of the Internet.